At Atir Design we have paid special attention to the design of our rope ends as we feel it is imperative that idle fingers are unable to disconnect the rope ends from the posts at any time. This will obviously avoid the inconvenience and loss of time in the replacement of ropes by our staff. Our rope end attachments are manufactured from solid brass to enable many years of reliable service. Another feature of these rope ends is that they may be purchased in a variety of finishes which will co-ordinate with the ropes, stands, and decor. Maintaining a high standard of product quality is of the utmost importance. It is for this reason Atir Design have created an association with Donaghy Ind. 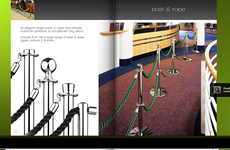 who manufacture only the highest standard of barrier ropes. A large colour range ensures that every need can be met.